Meyer lemons get more popular every year, and what was a relatively unknown fruit just a few years ago can now be found on restaurant menus, in mainstream supermarkets and food/home magazines. Meyer lemons aren’t lemons; they’re actually a hybrid between a mandarin orange and a lemon. The cross was originally developed in China, where both types of citrus fruit occur naturally. The fruit was brought into the US in the early 1900s by a man named Frank Meyer, after whom the lemons are named. Meyer lemons are generally smaller than regular lemons, with a spherical shape and a thin peel. They tend to be more of a golden color than a bright yellow. Since Meyers are a hybrid, they have a different flavor than standard lemons. They are slightly sweeter and much less acidic. They still taste like lemons, of course, they just don’t have the same zesty bite to them. They’re more expensive than regular lemons, but tend to be very juicy. I should also note that although most Meyer lemons will fit in with this description, not all of them will. I am lucky enough to have a small Meyer lemon tree (note that it can be cheaper to keep a small tree in a yard or a large pot than buying Meyer lemons when they’re in season) and my lemons are huge. They’re easily three times the size of the lemons I see in stores and they have a fairly thick rind, although the Meyer lemon flavor is spot-on. Meyer lemons are a good choice for most recipes that call for lemon because you can get a full lemon flavor without having to add excess sugar (or other ingredients) to temper the acidity of the lemon. They’re great in desserts and all kinds of baked goods, and work wonderfully in savory dishes where you don’t want lemon to overwhelm the rest of the meal. That being said, they’re not the greatest choice for lemon recipes where you really want that extra acidity – like lemonade, for instance. 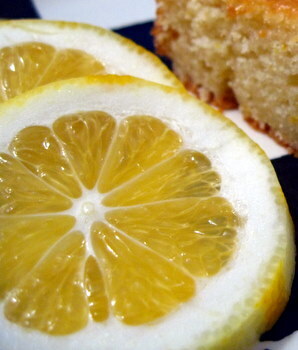 I buy my Meyer lemons from http://www.lemonladies.com They are always fresh, juicy and great. 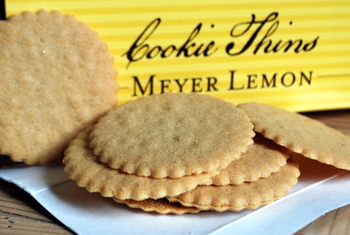 Glad to hear about these lemon thins. I’d love to have a lemon tree but I’d kill it. I’m death on plants. I do love to use the Meyer lemons in recipes and look forward to them each year. Mostly I buy them from TJs but occasionally find some at a decent price at other grocery stores. should be taken, especilly with small children. I live in Las Vegas. We have a Meyer lemon tree that every year gives us an over abundance of gorgeous lemons. Ours are huge also. Probably twice the size of lemons you see in the grocery store. You have to use them up though or they will give baked goods a metallic taste. The juice freezes well though and can be used for sauces and lemonade throughout the year. My grandmother has had Meyer Lemon trees in her back yard as long as I can remember. Like yours, they tend to be pretty big, but have that same wonderful meyer lemon flavor that the smaller ones do. Thanks for the wonderful information about Meyer lemons, its a very useful articles! Just FYI, a thick rind on Meyer lemons is often caused by either too much nitrogen (from manure or fertilizers with a lot of the first number) or not enough phosphorus. Try adding some bone meal around the base of your lemon. It may even improve the flavor of the lemons! Meyer Lemons are pricey…..but so worth it.